Brand New Sealed Motorola Talkabout 10 Pack MS350R Set. Motorolas Talkabout MS350 is by no means a fair weather radio. Dont worry about transmission failure when it makes contact with water. Its IP-67 standard withstands constant submersion of up to 1m for 30 minutes and repels the heaviest of rain droplets. IT FLOATS MAKES FOR EASY RECOVERY If your MS350 radio happens to fall into the water, dont despair. Through meticulous engineering, the radio floats and is visible on the water surface. Once recovered, use your MS350 radio to keep talking and listening. HEADSET CONNECTOR USE WITH YOUR FAVORITE MOTOROLA AUDIO ACCESSORIES Hands-free devices provide you with many advantages, the main ones being discreet communication, sound enhancement in noisy environments, and the ability to multitask. The MS350 waterproof radio is equipped with a headset jack connector ready for use with any of your favorite Motorola audio accessories. ERGONOMIC DESIGN FUNCTIONAL BUT SLEEK Designed to maximize operators productivity, its hourglass shape fits snugly into the palms of your hands reducing fatigue and discomfort typically experienced with the competitions brand. The non-slip ridges, on its base housing, eliminate annoying hand slips. Although built for function, the MS350 radio boasts a sleek contemporary look that holds its own with any trendsetter. REPEATER FUNCTION IMPROVES YOUR COVERAGE BEYOND THE HORIZON Maximize your camping, sporting or hunting experience by improving your radio transmission coverage when talking to family or group members who sometimes wander far beyond the line of sight. Thanks to the built-in repeater channels, the MS350 works well with a local repeater station to carry your signal further. Take advantage of this value-added feature by switching to GMRS channels 15R-22R, but dont forget youll need a GMRS license and an accessible repeater station to take advantage of this unique feature. NOAA WEATHER CHANNELS Want to keep in touch with changing weather conditions during your family camping adventure? No need to stop the fun weather alerts will provide your group with warnings of incoming storms or dangerous conditions. And, by tuning in to one of 7 NOAA channels (National Oceanic and Atmospheric Administration) on your MS350, you will always know what to pack with continuous local and regional weather broadcasting. MS350R includes 10 radios 10 belt clips 5 dual drop-in charger 5 charging adaptor 10 NiMH rechargeable battery packs 5 Emergency Preparedness checklist sheet 5 Users Guide 5 Accessories brochure Available in yellow. How far can I expect my radios to communicate? The communication range quoted is calculated under optimum conditions, with an unobstructed line of sight. Actual range will vary depending on terrain and conditions, and is often less than the maximum possible. Your actual range will be limited by several factors including, but not limited to, terrain, weather conditions, electromagnetic interference and obstructions. This radio meets IP-67 standards. It will withstand submersion of up to 1m for 30 minutes. Radio floats with included NiMH battery. It may not float with some AA batteries. Use of headset should be in dry environments only. All questions/comments are routed to a mobile device, so you WILL receive a very quick response! All items must include original packaging to receive a credit. 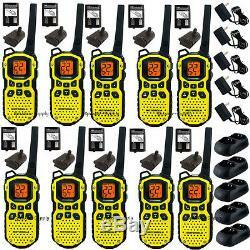 The item "Motorola Talkabout MS350R Waterproof Walkie Talkie 10 Pack Set 35 Mile Two Way" is in sale since Sunday, March 29, 2015.